Wednesday April 15th 1896 I cleaned up the house and got dinner. Father and Mother got here just before noon. They stayed till nearly night. It was a windy day. The boys were plowing for potatoes and working about the place. I made the sleeves for my [jet?] waist. 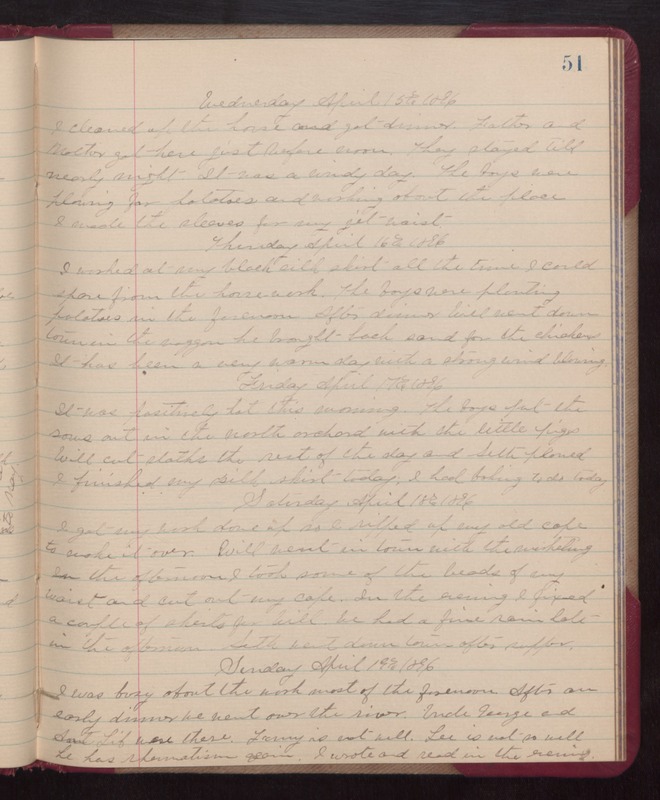 Thursday April 16th 1896 I worked at my black silk skirt all the time I could spare from the house work. The boys were planting potatoes in the forenoon. After dinner Will went down town in the waggon he brought back sand for the chickens. It has been a very warm day with a strong wind blowing. Friday April 17th 1896 It was positively hot this morning. The boys put the sows out in the north orchard with the little pigs. Will cut slaths the rest of the day and Seth plowed. I finished my silk skirt today. I had baking to do today. Saturday April 18th 1896 I got my work down up so I ripped up my old cape to make it over. Will went in town with the marketing. In the afternoon I took some of the beads of my waist and cut out my cape. In the evening I fixed a couple of shirts for Will. We had a fine rain late in the afternoon. Seth went down town after supper. Sunday April 19th 1896 I was busy about the work most of the forenoon. After an early dinner we went over the river. Uncle George and Aunt Lib were there. Fanny is not well. Lee is not so well. He had rheumatism again. I wrote and read in the evening.